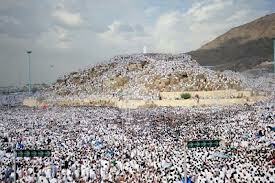 Today is the day of Arafa, the best day of the year. Alhamdulillah I am so glad that Allah Subhana wa ta'ala has once again blessed us with this great day, alhamdulillah. We are fasting today as it is highly recommended to fast. According to our beloved prophet Muhammad Sallallahu alaihe wa sallam's sunnah, the fast will erase the sins of previous and and next year, bi'idnillah. May Allah Subahana wa ta'ala accept our humble deeds and shower us with His mercy , ameen! 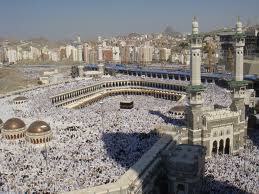 May Allah subhana ta'ala accept the hajj of all the people who are performing hajj this year, ameen! I have been watching the live coverage of Hajj at Islam channel and some other Chanel. The little mountain of Arafa always get packed with people, the pilgrims. There is no need for people to sit there . They can stay in their tent and concentrate on making duas to Allah subhana ta'ala. Alhamdulillah we are so blessed as Muslims. We can be anywhere but Allah subhana ta'ala can listen to our needs. On FB I just seen a beautiful quote which just reminded me how blessed we are, alhamdulillah. "You don't have to be in Arafah to have your sins forgiven. Wherever you are - whether you're in a bustling city or in the depths of a small village, just sincerely ask Allah for forgiveness and He will forgive you!" We have started our takbeer-e-tashreek since fajr salah today. The five days of the Month of Dhul-Hijjah starting from 9th (which is today) up to 13th are called Ayyam Al-Tashreeq. So Takbeer-e-Tashreeq begins from the ‘Fajr’ prayer of the 9th Dhul Hijjah, and shall be continued up to the 'Asr’ prayer of the 13th Dhul Hijjah. Takbeer should be recited immediately after every Fardh prayer, male Muslims should recite it loudly voice, while females in a low voice, whether performing Salah with Jama'ah, collectively or individually. Every year during this time, I remember my hajj in 2006. Alhamdulillah it was an amazing experience. I hope and make sincere dua that Allah subhana wa ta'ala give us the opportunity to visit His House many times with family and friends, Ameen! I hope everyone is having a very productive Arafa today, inshAllah.